Fits into the three bayonet battery openings that measure 2.680 inches (approx. 2-11/16) from the center of one hole to the center of the next. Please measure your battery before ordering. Quantity discount for 24 or more. Fits into the four bayonet battery openings that measure 2.50 inches from the center of one hole to the center of the next. Please measure your battery before ordering. 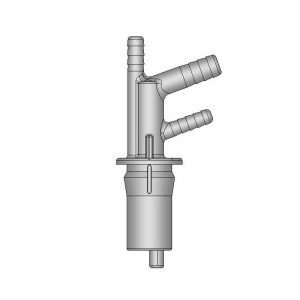 Push-in battery acid recirculation fitting for battery formation charging systems. Faster installation and removal than bayonet models. Fits into bayonet style vent wells. Rotates 360° for easy hose positioning. Economical one-piece design. 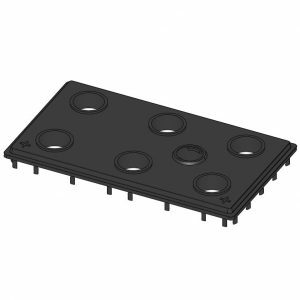 This item is an important component of battery formation equipment. Click here to contact us for pricing or further information. Inside all lead-acid batteries, small particles are formed which eventually fall to the bottom where they accumulate. If this debris builds up against the lead plates, short circuits can occur resulting in a defective battery. 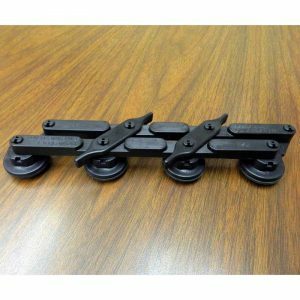 To prevent that from happening, our Bridge Rest supports are placed under the battery plates, providing room for the debris to accumulate below the plates. The patented design provides more room for the impurities to collect than molded-in ribs do, thereby greatly increasing battery life. 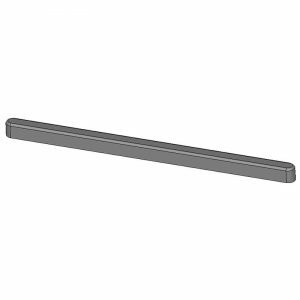 We manufacture bridge rests in both standard and custom sizes. To receive a quote for any custom size, click here to email us. Now available with our patented dielectric fluid saver insert, this option allows a battery manufacturer to produce a low maintenance battery. Our insert has been granted patent #8,999,565 by the US Patent Office. During our manufacturing process, this insert is welded in place to produce a hybrid cover. Electrolyte vapor that normally escapes from the battery condenses on the insert and is retained inside the battery. Watering intervals are increased, resulting in lower maintenance costs and more uptime. An independent lab test revealed that our hybrid cover produced up to a 25% water savings over a control group of standard battery covers. 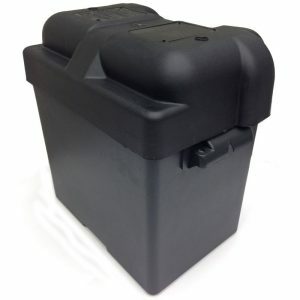 We manufacture battery lids in both standard and custom sizes for battery OEM and battery manufacturers. Click on the links below to view our current drawings (your browser must be set to allow pop-ups). To receive a quote for any custom size, click here to send us an email. Our battery connectors have been subjected to rigorous testing and are UL approved. They are made of impact resistant Lexan® to provide high strength, superior dielectric properties, and a UL94 V0 flammability rating. 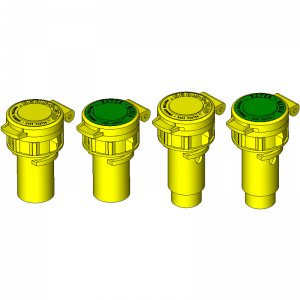 Each housing contains two stainless steel springs to provide a secure connection and superior conductivity. 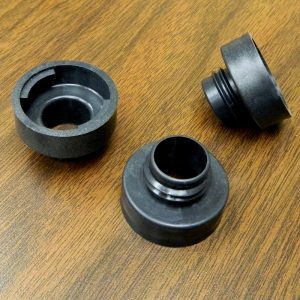 Our low-cost connectors are an economical replacement for damaged or worn out battery connectors. 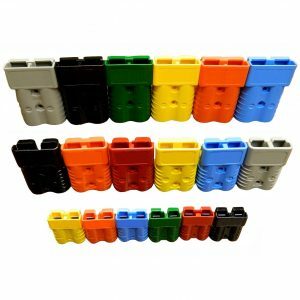 Our connector is compatible with, and will fit most other major brands and are interchangeable with them. These may be purchased either with or without a set of contacts. 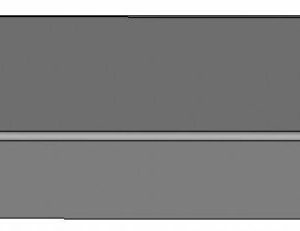 Our contacts are constructed of silver-plated copper to provide ultra-low resistance for maximum conductivity. 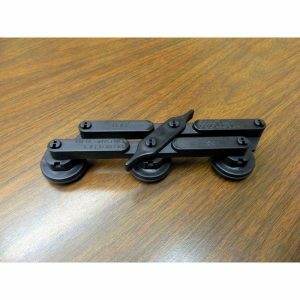 You may connect them to your cables by either crimping or soldering them, but we recommend crimping them with a good quality hydraulic crimping tool that is made for this purpose. The contacts are available in most common wire sizes from #12 AWG up to 4/0 AWG. Dealer inquiries are welcome. Quantity discounts are available. 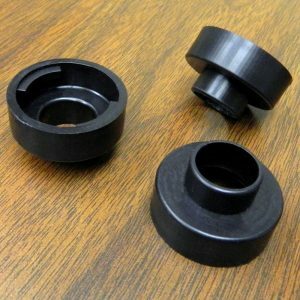 Our battery connectors are available with your custom brand or logo molded into the plastic. Made in the USA at our factory in Ohio. Click here to contact us for pricing. 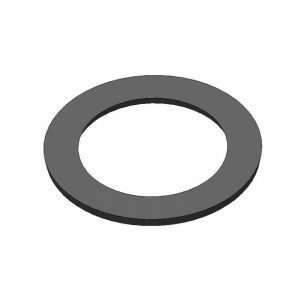 We manufacture edge protectors for battery element plates, in both standard and custom sizes. Click on the links below to view our current drawings (your browser must be set to allow pop-ups). To receive a quote for any custom size, click here to email us. Battery plate edge protectors (or boots) cover the bottom edge of positive or negative battery plates to protect them from scratches, nicks, or other damage that could occur during production. 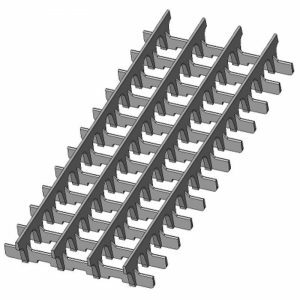 Some manufacturers use them for negative edge protection on the top edges of the plates to ensure a long battery life by reducing mossing shorts along the top of the plates. Click here to contact us for pricing or further information. To buy, select an item in the drop down box by clicking on the “▼” below. Then enter the quantity, then click the “Add to cart” button, then click the “Checkout” button on the left. Product color is black. More colors are available. Contact us for details.